Child-friendly?Fantastic Mr. Fox is an animated movie based on the best-selling children’s book by Roald Dahl. It’s about a fox that becomes bored with his career and starts stealing from some of the farmers. The movie is directed by Wes Anderson and has some edginess including smoking and some slang humor that some may not expect from a movie based on a children’s book. It will appeal to both adults and children with its humor and is recommended for kids aged seven and up. Fantastic Mr. Fox is the story of a fox that starts looking for an adventure to spice up his boring job as a newspaper columnist. Against the advice of his wife, he begins stealing game and cider from three big farmers  Boggis, Bunce and Bean. When they try to find Mr. Fox and kill him, he and his family are forced underground where they meet up with other animals that he’s endangered with his stealing. The animals then band together to outwit the mean farmers. The movie has an all-star cast including George Clooney as Mr. Fox, Meryl Streep as his wife, as well as Bill Murray, Owen Wilson and Willem Dafoe. It uses stop motion animation, which is a technique that makes physically manipulated objects appear to move on their own. However, it is unlike the flashy or 3-D animation in many other movies kids have become used to. Some of the themes and the humor in the movie may go over kids’ heads, but adults, especially those who have enjoyed Anderson’s past work like Rushmore, may enjoy it. Parents should be aware that there are some scenes that depict violence but they are not too graphic or too scary. In addition, there are scenes depicting drinking and smoking. 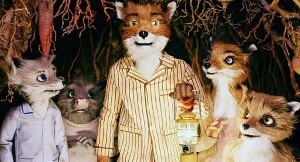 Overall, Fantastic Mr. Fox delivers an entertaining adaptation with a few positive messages for kids and parents alike.